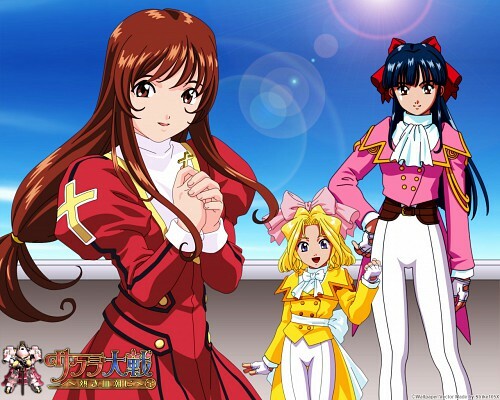 I'm in an extreme Sakura Wars mood (well it is my favorite anime), just seen all of it (TV series, OVAs, the movie, the movie twice actually gonna rewatch the series again to i think) and i'm trying now to play the game (though even with a printed translation i'm advancing at a snail's pace)... oh wait sorry i'm getting carried away back to the paper, this is something i made for myself, so probably nothing is going to change as i achieved what i wanted, which was a simple wallpaper with the 3 characters i loved the most in Sakura Wars franchise. Except the Koubu and the logo pretty much made everything here through vectors, because i wasn't satisfied with what i found online regarding wallpapers,so i made something myself containing my 3 most favorite characters: Erica, Sakura and Iris (though truth be told i do like'm all). Sharing it if someone else finds it good. Browse Sakura Wars Gallery: Recent | Popular. I really like your wallpaper, I too am a Sakura Wars fan and these three characters you used for your wallpaper. Great job and thanks for posting! The blonde girl is a little bit blurry compared to the others. Are they vectors you did yourself or did you find them online? If the latter, you definitely want to credit the artist. My only complaint is the blurriness. like i said in the description everything except for the Kubo and the logo/text is made by me through vectoring, also sorry to hear about the blur but on my side Iris doesn't look blurry at all.